Music history is littered with stories of how one record company exec or another didn't think a song would become a hit before being proved wrong when it did just that. This week in 1984, one such song debuted on the ARIA singles chart on its way to the top 10. The artist was proved right and his decision to leave the label that didn't believe in the track paid off. Not only that, but the song has actually been a top 10 hit in Australia twice - for the original artist in 1984 and for another one-hit wonder 13 years later. Speaking of doing things twice, "Original Sin" by INXS spent its second and final week at number 1 this week in 1984. It was an improvement on the performance of previous single "No Action", but this more upbeat track from forthcoming album This Island couldn't quite make it happen for Eurogliders. I only discovered this NZ top 5 hit thanks to one of Rage's recent Countdown repeats. It's a shame it didn't do better locally - and isn't available on the Australian iTunes store. He'd formed Dire Straits with brother Mark and was involved with the band's first three albums before going it alone. Sounding like his former band at their dreariest, "Soul Kissing" was David's debut single. This follow-up to "In A Big Country" did better than its predecessor in the UK, reaching the top 10. Not so in Australia, and I have to say I think we got it right with this pretty dull song. Before Ace Of Base fused reggae and dance a decade later, fellow Scandi act Laid Back visited the Caribbean - musically - on this European smash. You might also be familiar with the single's much-sampled B-side. After paying his dues as a backing singer and vocalist for TV ads, singer/songwriter Matthew Wilder landed his own record deal with Arista Records, but his one and only single for them, "Work So Hard", wasn't a hit. Written out of frustration at not being able to please Arista head honcho Clive Davis with any of his subsequent material, "Break My Stride" was also rejected by his label. As a result, Matthew asked to be released from his record deal. His new label at Epic Records had no issue with the reggae-lite song and label owner Joe Isgro was able to turn it into a hit. The much-covered and -sampled tune was Matthew's only hit in Australia, and was also the sole hit for dance act Unique II, who covered it in 1996. 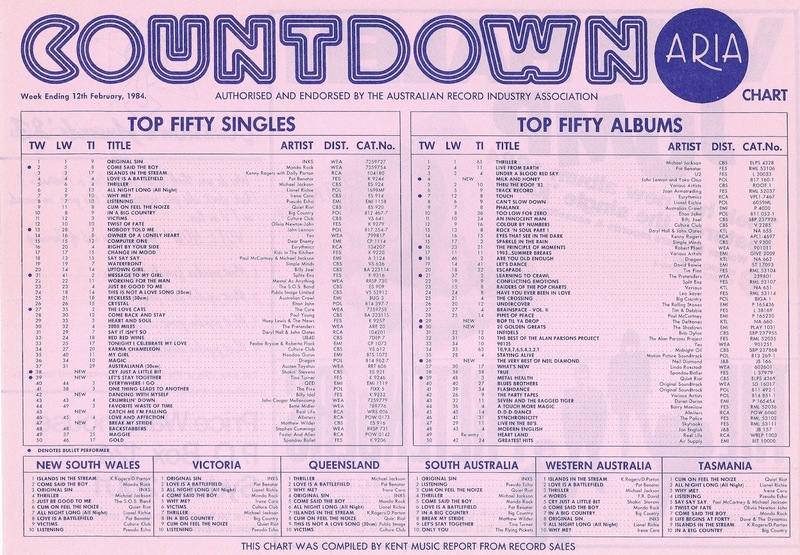 Matthew did have a couple of other top 100 entries in the US, like "The Kid's American", which was also taken from his debut album, I Don't Speak The Language. 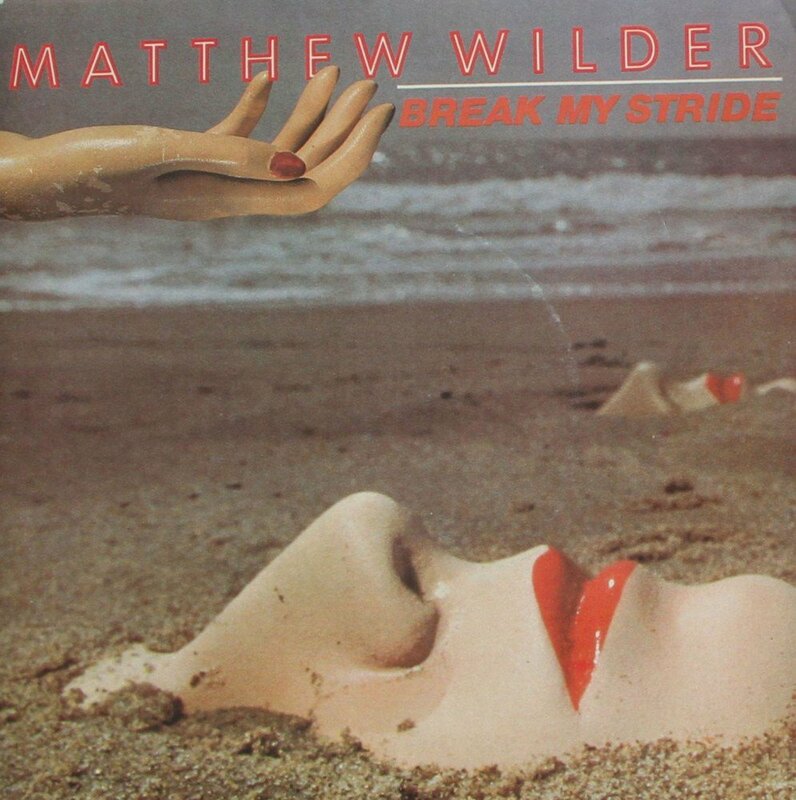 There was no music video made for "Break My Stride", but you can enjoy Matthew's appearance on Solid Gold below - complete with interruption from host Marilyn McCoo. After the temporary setback that was their second single, "Openhearted", synthpop band Real Life were back in the top 10 with the latest track lifted from debut album Heartland. Almost as brilliant as "Send Me An Angel", "Catch Me I'm Falling" also gave them a second top 40 hit in the US, but that's where the good times ended. The album's final single, "Always", wasn't released in Australia (but came out in Germany) and by the time Real Life returned in 1985, they only managed one minor hit from second album Flame. Despite appearances, the video below does play. Billy Idol was certainly a persistent guy. Not one to take no for an answer, he (or, at least, his record company) routinely re-released his songs, hoping to eventually turn them into hits. That practice started with "Dancing With Myself", which had been the final single by Billy's former band, Generation X, in 1980 and then his debut solo release the following year. In the gap between his first two albums, Billy Idol and Rebel Yell, "Dancing With Myself" came out again - and finally reached the ARIA top 50. It didn't get very high, but it did hang around, spending 16 weeks between the 40s and 60s. Other early singles like "Mony Mony" and "Hot In The City" would also get the re-release treatment in Australia, while in the UK, "White Wedding" and "Catch My Fall" came out more than once. Tina Turner's solo career hadn't offered up much in the way of chart action up until this point, but a new manager, a new record deal and a collaboration with the guys behind Heaven 17 changed all that. Having not released any music since 1979's Love Explosion album, Tina was one of the singers who provided guest vocals on an album of covers by British Electric Foundation (aka Ian Craig Marsh and Martyn Ware). The track she performed on was a remake of "Ball Of Confusion", and while not a hit, it did prompt Tina to work on another cover with the duo - a version of Al Green's 1971 single "Let's Stay Together". The synth-laden update of the song, which had been a US chart-topper for Al, was just what her career needed, and also reached the UK top 10 and US top 30. Suddenly, it was full steam ahead, with Tina given two weeks to record what would end up as Private Dancer. You don't hear much about him anymore, but in the early '80s, Shakin' Stevens (real name: Michael Barratt) was massive. Among his four top 10 hits were two consecutive number 1s, "This Ole House" and "You Drive Me Crazy". 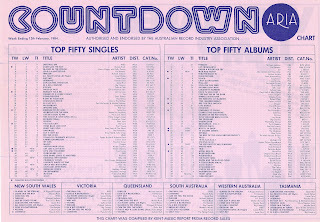 The fervour had died down - in Australia, at least - by 1984, with this less rock'n'roll and more pop-influenced single just missing the top 30. In the UK, "Cry Just A Little Bit" reached number 3 and Shakey would continue to score top 10 singles there until 1987. Next week: breakdancing reaches the ARIA chart, plus the biggest hit in four years for one British band and a surprisingly disappointing performance by another UK group. 'Break My Stride' and 'Catch Me I'm Falling' were two of my favourite singles that year. An upload from 'reallifeexperience' says that 'Always' "was never a single"; but they performed it on Countdown, and it charted in Germany. My mum had the 'Private Dancer' album on cassette, but I couldn't recall 'Let's Stay Together' when it aired on rage a few years ago. I love how the long-haired back-up dancer's hair is part of the dance routine. The only Shakin' Stevens songs I'm vaguely familiar with are those I've seen on Countdown repeats. Yes, Discogs only has it as a single in Germany - so probably why it didn't make the top 100 here! I may be wrong, but it seemed to me almost as though 'Always' by Real Life charted as an album rather than a single? 'Master Mix' made #74 on the album chart, but wasn't really an album, more a 5-track EP of remixes, plus "Always' and one other new song. It always seemed to me that 'Always' was regarded as a minor hit due to its appearance on Countdown. Even though Always is Track 3, perhaps it was considered as the lead track from the EP? Yes, and also, "Always' was performed on Countdown twice : first in July and then again in October for the tenth anniversary special, where almost every song performed was a big hit. It's certainly a potential hit single that somehow slipped between the cracks.